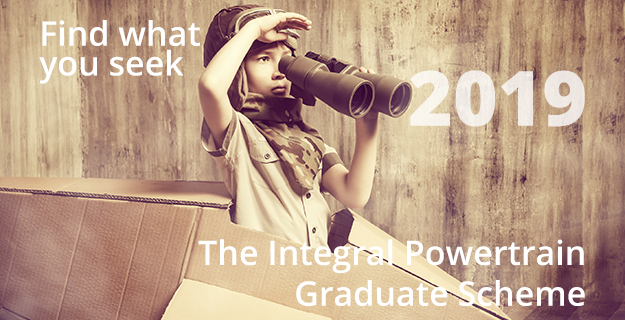 Integral Powertrain (IP) is delighted to announce the launch of its 2019 Graduate Scheme. The scheme is aimed at encouraging talented and ambitious graduates to take a significant role in engineering the future of e-Mobility. Integral Powertrain are committed to remain at the forefront of Motorsport powertrain. At the same time, we are taking what we have learnt on the track to lead electric and hybrid automotive powertrain development on the road. To continue our relentless pursuit of next generation technology, we require new generations of engineers who can keep breaking ground, find innovative solutions to complex problems and make the impossible possible. To launch the 2019 Graduate Scheme, we take a look back at another extremely successful year at IP and would like to share the experiences of the Graduates who recently came to the end of their first year with us. “I initially applied to Integral Powertrain as I was determined to work in the Hybrid/EV automotive sector and I felt a SME would help shape my career in the most effective way. This wasn’t far from the truth as I’ve felt like an integral part of the team since day one, having strongly contributed to several projects. The most difficult challenge I have faced has been that very little of what I do now was formally taught during my degree (except for the fundamentals having done a degree in Physics) and so the learning curve on the job has been steep, but ultimately rewarding. With the great support here at IP, I can even go as far as saying I’ve learnt more in the past year than I did during my time at university. Having had the opportunity to work on projects such as the VW I.D. R Pike’s Peak racecar, it has truly been a great experience and as cliché as it may sound, it’s hard to imagine a better start to my career. “I originally applied to Integral Powertrain as I had been searching for graduate schemes in the automotive & motorsport sector and the opportunity of working with e-drives in that field to future proof my career was very exciting. I have enjoyed the hands-on approach and responsibility that was given to me early on. As the company is growing I have had the chance to be involved in a wide variety of work very early on in my development. The learning curve has been steep, coming from a mechanical engineering background I had a lot to learn on the electronics side. It’s exciting to be part of a team developing cutting edge technology, particularly seeing all electric power starting to break records previously held by internal combustion powered vehicles, namely the VW I.D. R Pikes Peak hill climb. By giving responsibility early in the graduate rotation, IP encourages you to take ownership of your work while still making more experienced team members available to offer guidance when needed. My biggest achievement so far has been some research I carried out directly changing the design of the motor for one of our largest projects. “After graduating from Oxford Brookes University, I was on the search for an interesting and challenging position. The graduate scheme at Integral Powertrain drew my attention as they are a company who endeavour to develop new and innovative technology enabling them to produce world class products. “What interested me about Integral Powertrain was their connection to the electric vehicle industry and that their involvement spans from the concept phase all the way to production. What I have enjoyed most is the undertaking of significant and purposeful work, of which I can gauge the outcomes directly. One of the most exciting developments during my time here has been the successful implementation of two IP motors in the VW I.D. R prototype electric vehicle. Our graduate scheme is designed to support promising, passionate engineers reach their full potential and make a valued contribution from day one. Working with our world leading engineering teams you will have a rare and unique opportunity to gain an invaluable understanding of our engineering processes, methods and products from first concept to track and road. Throughout the two-year scheme, you will create concepts through design and analysis; build, test and develop prototypes and gain an appreciation of the software and electronics which help power and control the technology. We have expert engineers from a variety of disciplines to learn from and many new and amazing products in creation. You too can be part of rewriting the record books and creating the advanced e-Mobility products of the future.